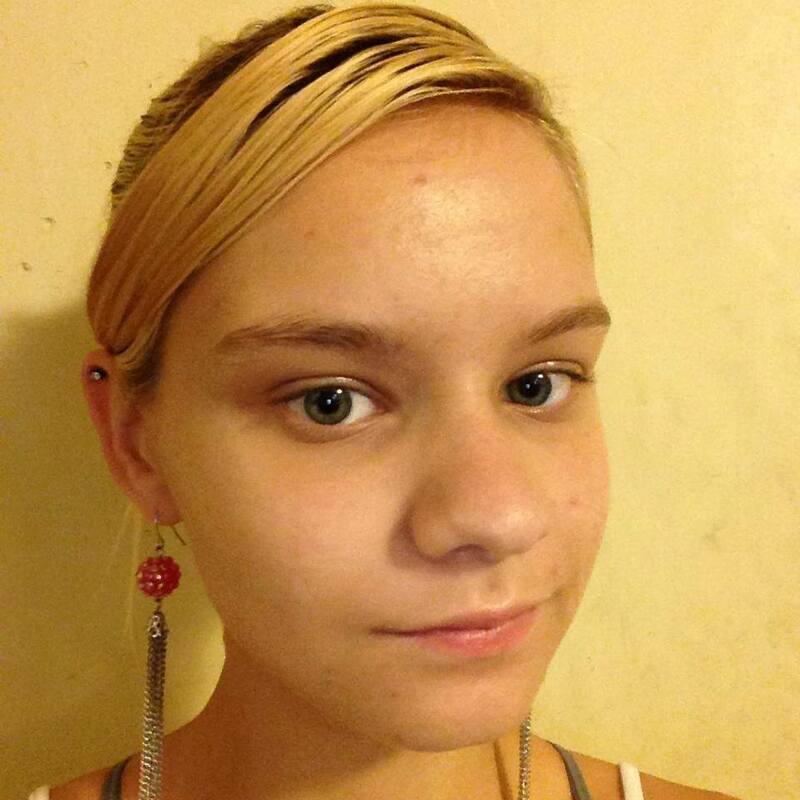 Cassie Kay Compton from Stuttgart, Arkansas disappeared on September 14, 2014 from her home. 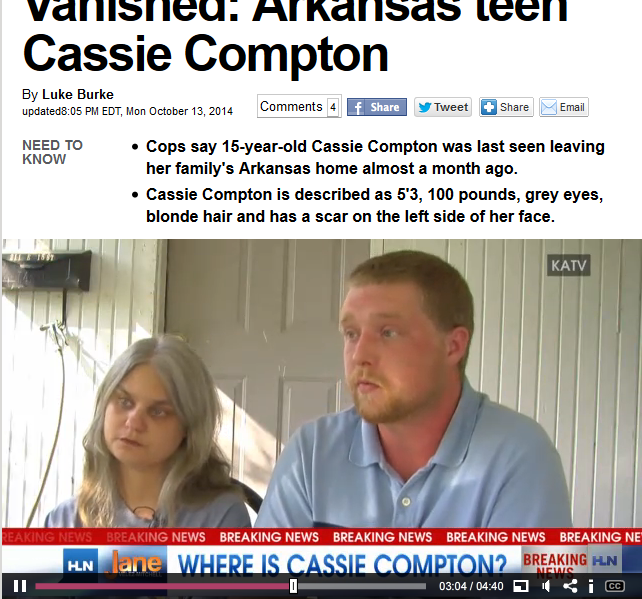 Cassie was 16 years old, is 5’3″ tall and weighs about 100 pounds. The teen has dyed blonde hair and blue eyes, a dark birthmark of a sideways heart on her upper left arm, and a scar on the left side of the face, beginning at the cheek-line near her nose. She was last seen wearing a blue spaghetti-strap top, blue & white plaid shorts and blue & gray cowgirl boots with 2” – 3” heels, and carrying a black LG smartphone. The Stuttgart Police Department, Arkansas State Police, and FBI-Little Rock Field Office are investigating the girl’s disappearance. She has been described as 5’3″ and about 100 lbs. Cassie has a scar on her left cheek, beginning at the cheek-line near her nose. Cassie has a dark birthmark of a sideways heart on her upper left arm. It is unconfirmed, but speculated that she was wearing a blue spaghetti-strap top, blue & white plaid shorts and blue & gray cowgirl boots with 2” – 3” heels (info gained from a TexasEquuSearch flyer). No friend or family member has come forward publicly with her last known clothing. There has been no confirmation of her height/weight from the doctor. Cassie’s mom, Judy Compton (JC) was born in 1972. She is disabled, unknown cause. JCs live-in fiancé, Brandon Lee Rhodes (BR), was born in 1989. JC and BR got engaged in 2012. BR did not have a job. BR did not have a car, nor driver’s license. He was known to ride his bike everywhere. JC has a vehicle. Insiders claim that sometimes BR took JC’s car, especially while she was asleep. Vehicle is a blue Chevy Impala with a disabled tag. Year of car unknown. Cassie’s bio dad, Roy W. Compton (RC), lives in Oklahoma. Police may have followed up on leads with family in Kingston, Oklahoma. Cassie was home-schooled, working to obtain her GED. 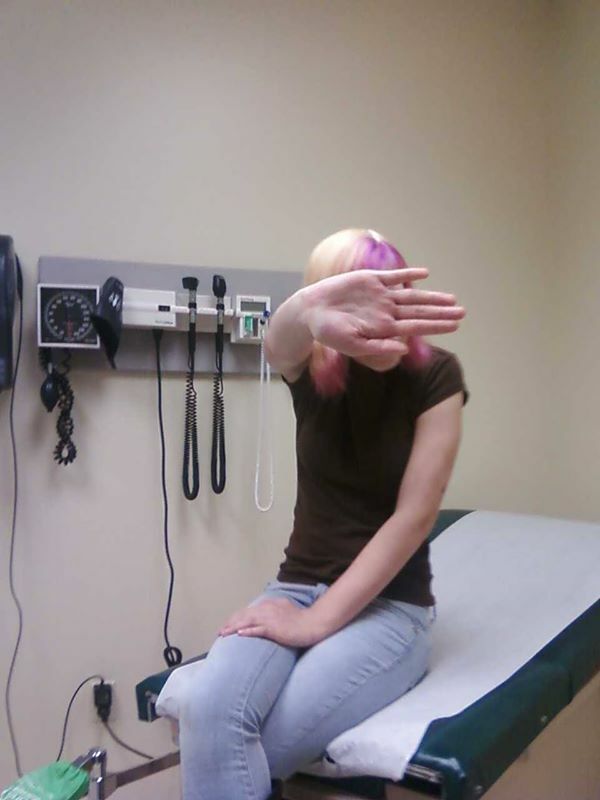 Cassie was reported to have gone to the Friday night school football game on 9/12/14. Cassie was picked up at 1:30 pm on Saturday 9/13/14, then spent the night with friend Hunter Snyder (HS) and family, who say she is there a lot because of problems inside her (Cassie’s) home. Cassie went to the demolition derby in DeWitt on Saturday (9/13/14) with the Snyder family. Video 1 No photos, descriptions of Cassie’s clothes, or any other evidence has been provided by the Snyders to verify this trip. Cassie spent the night at the Snyder home on Saturday night. During the day Sunday, Tracey Snyder (TS), HS’s mother, felt Cassie was unusually quiet. 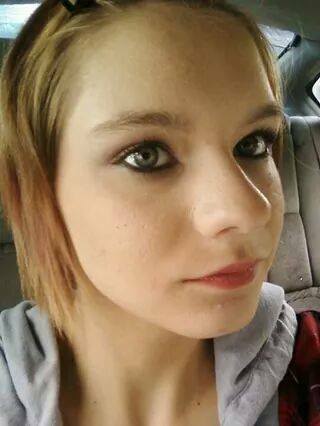 Cassie was driven home on 9/14/14 by Snyder family member and friend HS. TS said HS and Cassie left the Snyder residence at 6:05 pm. We do not know what Cassie was wearing when she left the Snyder residence. Cassie is reported to have been unusually quiet over the weekend and on the ride home. HS says he dropped Cassie off at 6:20-6:25 pm. HS says he saw BR standing out front, and that BR saw but did not speak with Cassie as she walked up the pathway. Cassie did not come in to the bedroom, nor respond. JC said had been sick and sleeping in her bedroom until 8:12 pm. JC says Cassie changed her clothes, although JC was sick in bed and did not see her. We do not know what clothes Cassie changed in to. HS arrived back home at 6:45 pm. It is unknown if Cassie had money in her pockets. Cassie’s ‘parents’ said she would often grab her phone and go for a walk down the road that is on the corner of her block. An insider claims that JC said Cassie had run away twice, for 3-4 days, since BR had came into their lives. Specifics unknown. At 9:14 pm on 9/14/14, BR called TS to ‘see if Cassie was still there’, or if she or HS knew where Cassie was that night. JC said she then called friends to see if she Cassie was there and she wasn’t. It was then that worry began to set in and law enforcement was called. 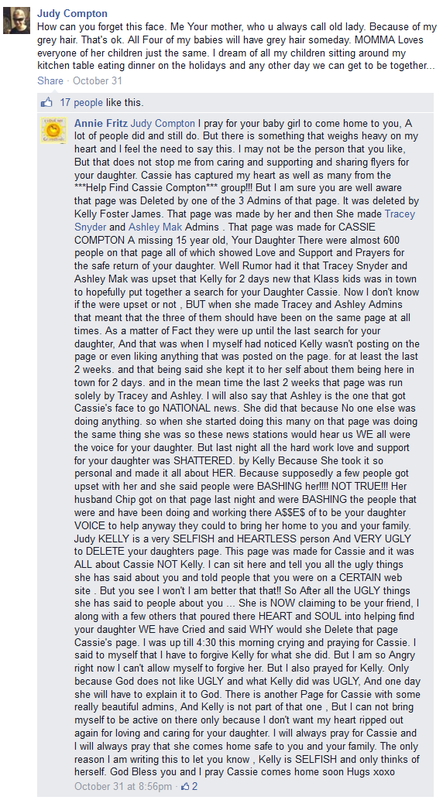 JC says she is the one who reported Cassie missing. BR says he rode his bike to the police station Sunday night 9/14/14 to report Cassie missing, and that law enforcement told him he had to wait 72 hours to report her missing. Time of visit to PD is unknown, and there is no confirmation or record of his claim. 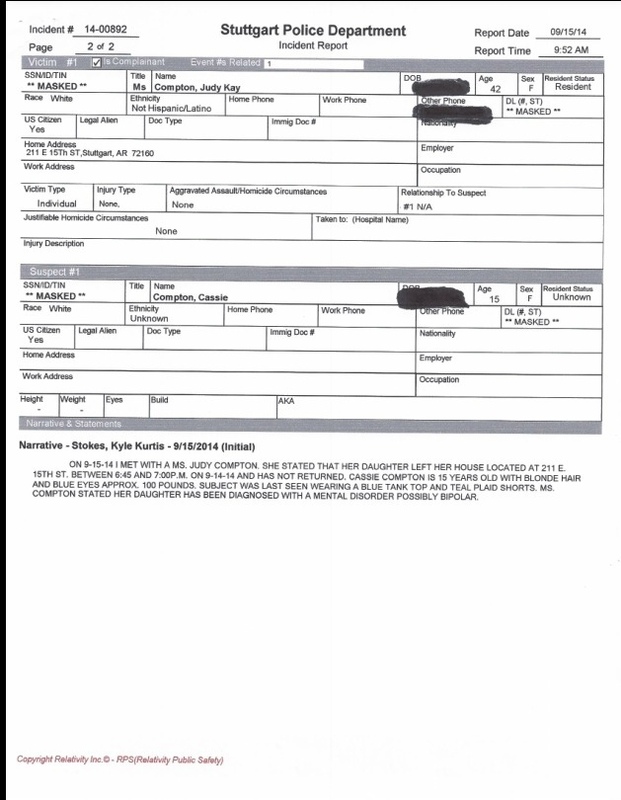 Law enforcement has not made available the police report, missing persons report, or dispatch records. These are a matter of public record, and via the Freedom of Information Act they should be made available to anyone asking for copies. 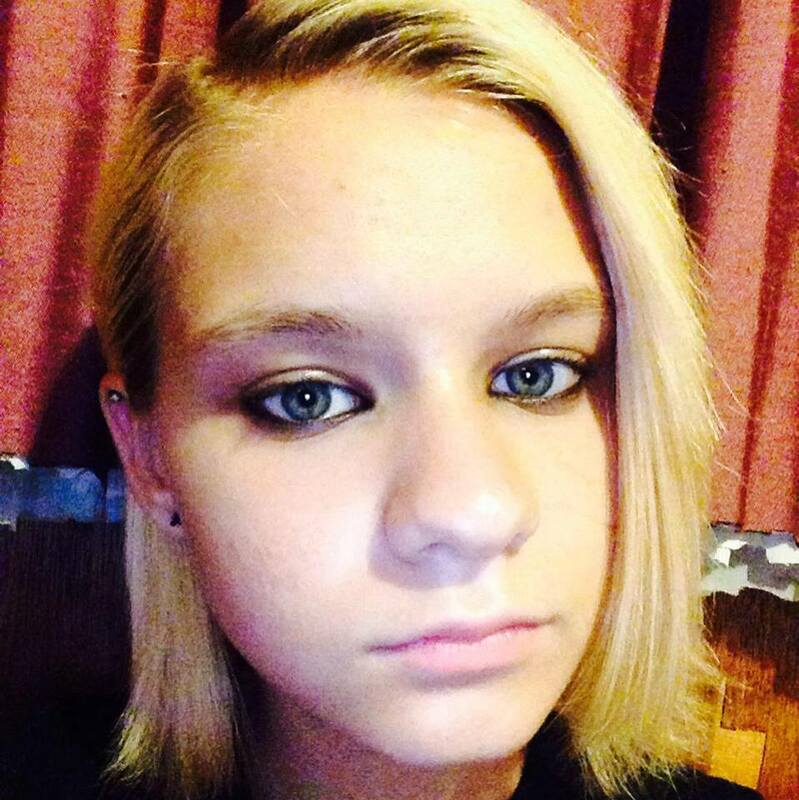 Assistant Chief Steven Bobo of the Stuttgart police department said Cassie was considered a runaway at first, until past leads contradicted that. BR and JC are interviewed, and BR clearly has a beard. 10/3/14 JC and BR had their phones seized by authorities as part of the search. Insider describes how witness saw smoke directly after police left residence, and fire department arrived to put fire out. Small internal house fire. No obvious damage outside. Log from fire department not available. 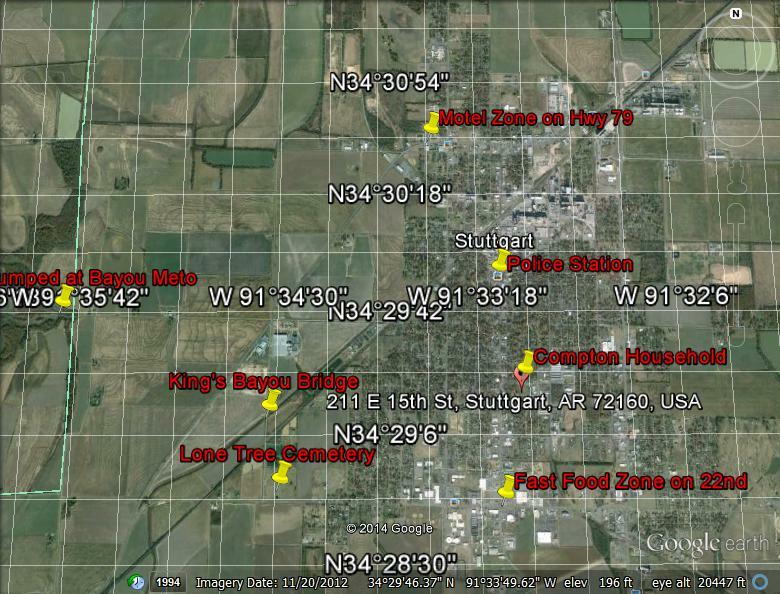 Phone pings from someone in the case were detected in the Casscoe area, which then yielded a search. 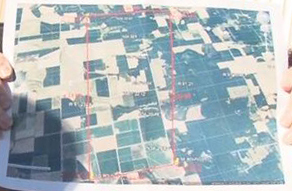 10/4/14 Search led by local police and FBI started around the local airport and searched between Casscoe and Almyra. Nothing was recovered that day that that was grounds for a further investigation. 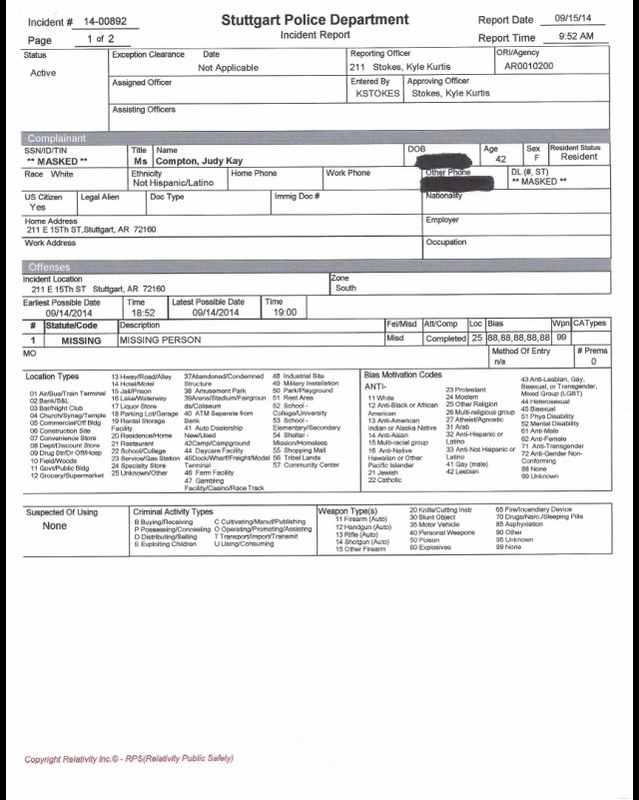 10/4/14 An insider reports to law enforcement evidence found at the Bayou Meto bridge about 15 miles from Casscoe. It is determined that the objects were purposefully placed near the creek under bridge on the night of 10/3/14. Objects included a half drank gatorade bottle, two mens shirts, men’s toiletries (including shave cream), two folded drapes, a girl’s ‘hugs and kisses’ sweater, a teddy bear, and two newish carrying bags. BR is suddenly beardless in his booking mugshot. 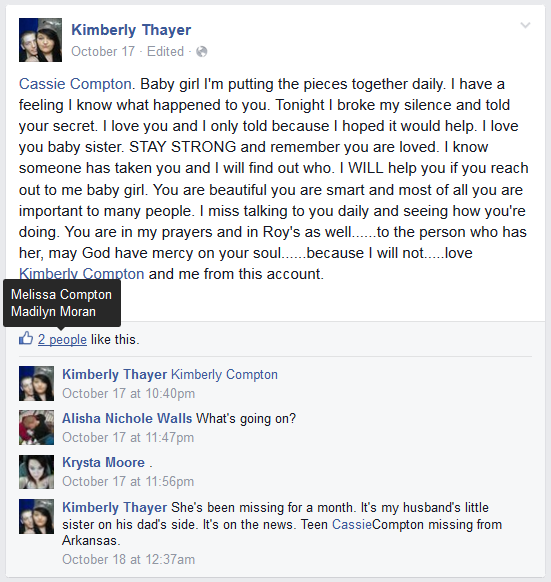 10/17/14 Cassie’s brother and sister in law claim to know “her secret”. Knows who ‘took her’. 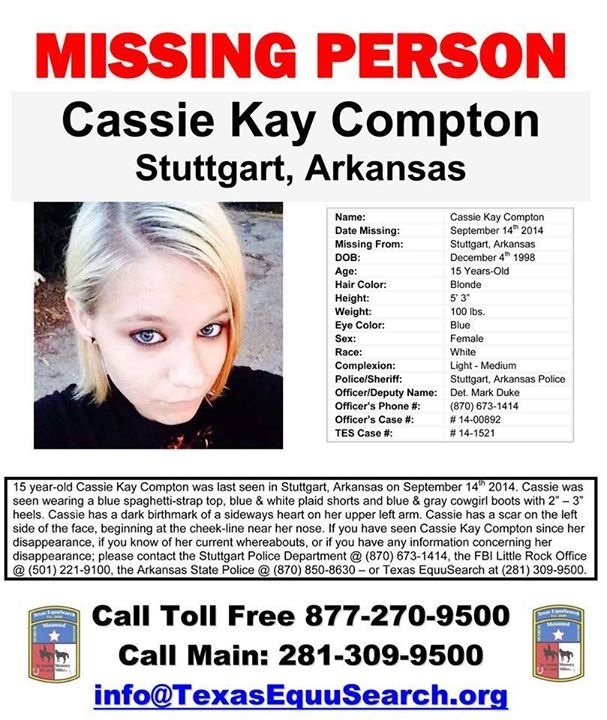 10/18/14 Search started one block from Cassie’s home and visited many Stuttgart locations. 11/7/14 JC and BR are still considered suspects in Cassie’s disappearance. JC has a new cell phone number. Cassie doesn’t qualify for a Morgan Nick-amber alert there is no apparent imminent harm or possible death. 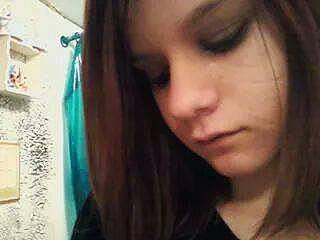 More than one person has accessed Cassie’s Facebook account since she disappeared. GALLERY: Who is Cassie, the girl? 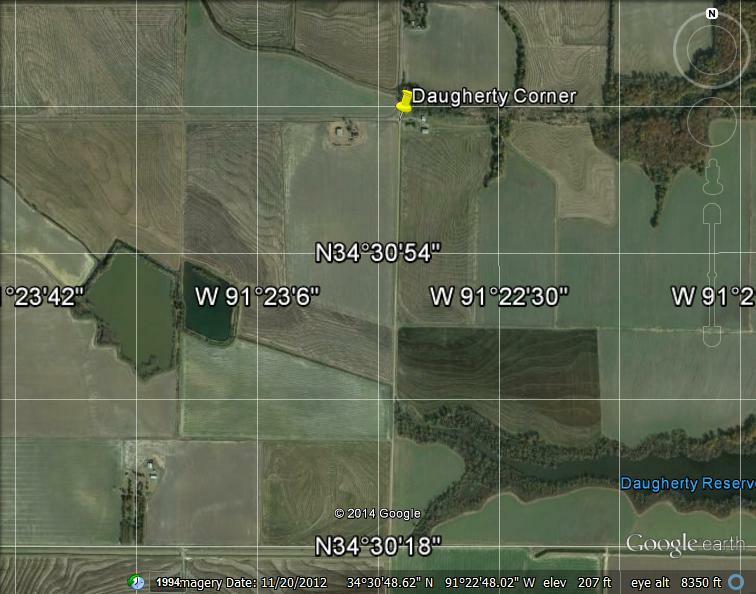 Section near Casscoe where phone pings were picked up.